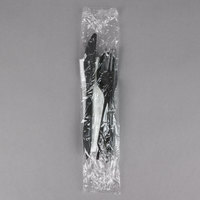 Provide your customers with the convenience of this medium weight black plastic cutlery set from Choice! 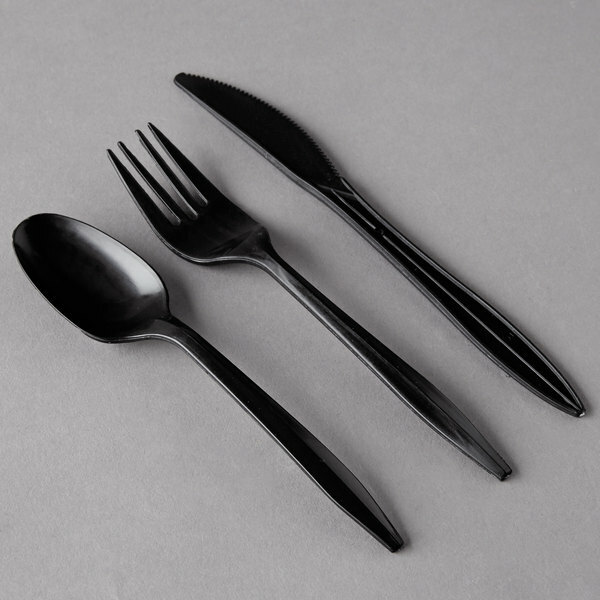 Wrapped in a clear poly wrapper and boasting a sleek black color, this medium weight, plastic cutlery set is just what your establishment needs. Not only does it increase the speed of service, but it also will satisfy your customers by keeping the utensils clean and sanitary! "Awesome quantity and pricing! Cutlery individually packed makes things easier and quicker bagging customers orders having fork, knife, and spoon all in one. Also sturdy enough to handle all the meals and desserts I've prepared. Nice, clean, neat, and professional appearance. 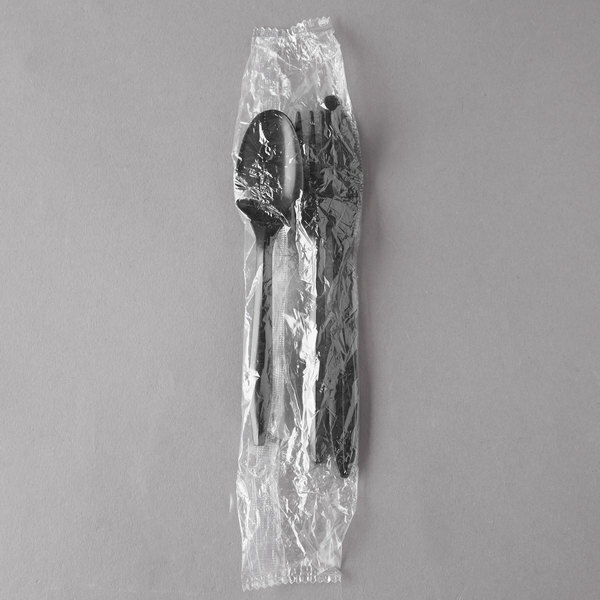 Definitely…"
Each wrapped package contains a black, medium weight knife, fork, and spoon. Since each pack is wrapped, your cutlery will not be exposed to any unwanted germs to help keep your customers happy and healthy! It also makes it easier to pack to-go orders since everything you need is in one packet! The medium weight utensils provide just the right amount of stability with less material to help both the environment and your bottom line! 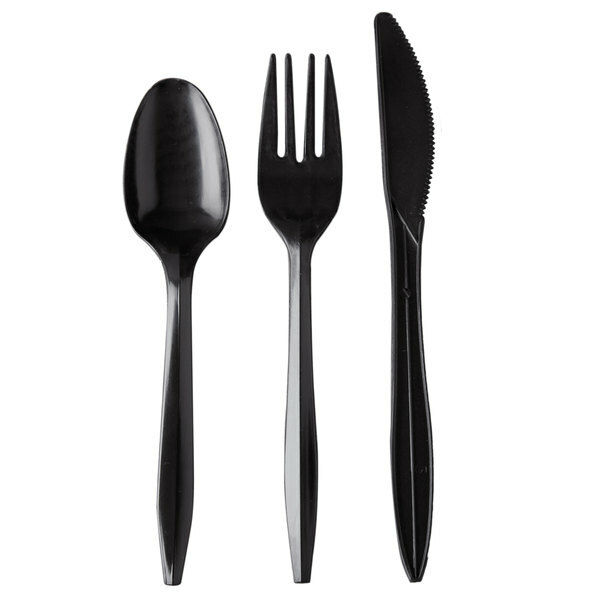 The sleek black color of this cutlery set can easily be dressed up or dressed down to fit in with a variety of venues. 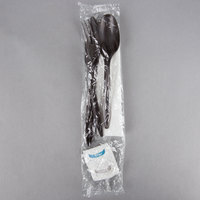 This inexpensive silverware to-go set works great for the purpose of sending something with customers. It won't work with our to-go salads, as we will need something heavier duty. We will probably go with a different product next time we order. When I deliver my dad a plate of food it looks professional. I always have some in the car in case I need them my mom said she wants so also. Very fast shipping. Good quality for the price. They help save on the cost of running a business. They work great for my breakfast restaurant. Will order again! This is a great little set. 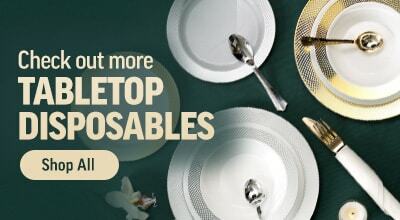 It saves you from having to roll plastic ware individually. These are a great value for not only money but time as well! Sturdy cutlery set for any take out needs. Stylish black color sets the set apart from cheaper brands. This item reflects your style and quality for customers that don't dine on site. I was extremely pleased to find these at a great cost! Best all around deal out there! This will do the job if you're looking for basic cutlery sets and of course, I chose the black and I am very pleased. Good weight and packaging. Easy to remove from the bag and looked nice along with the black containers. Customers liked the black instead of the traditional white cutlery. Will purchase again. These cutlery sets are great! They come with forks spoons and knives. I love these because they are strong and convenient. They don't come with napkins though. But great quality they are a medium weight plastic. 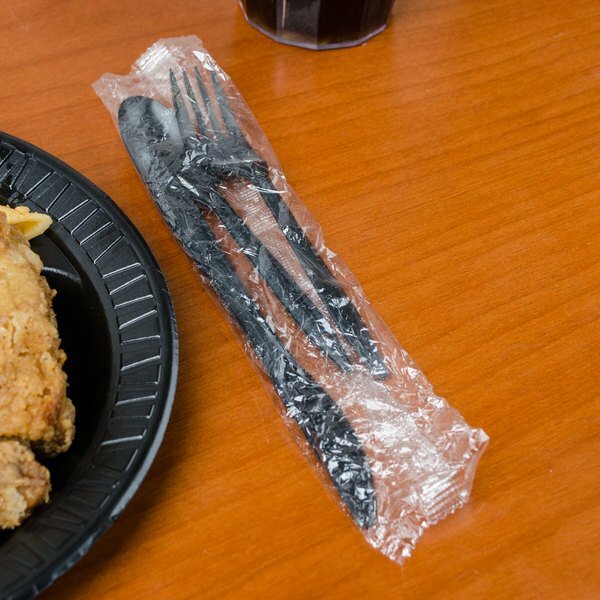 A convenient pre wrapped set of black plastic ware that is ready to,provided everything needed to enjoy a nice meal with the proper utensils all wrapped into one. Just as described and pictured. Great for catering needs and packed lunches! Very convenient, and will be ordering some more very soon. Love this store! We package this with all our takeout food. We don't get the set with the napkins since customers prefer to have more napkins than what's in there. This is perfect for every order. We like these. Worth getting them without the napkins as the napkins are always kind of cheap, so we just stuff napkins in the to go bag. Terrific addition. It is the complete package for any take out food no matter what they order. Plus they are wrapped in a simple package. Awesome quantity and pricing! 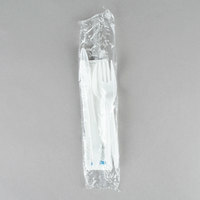 Cutlery individually packed makes things easier and quicker bagging customers orders having fork, knife, and spoon all in one. Also sturdy enough to handle all the meals and desserts I've prepared. Nice, clean, neat, and professional appearance. Definitely will buy again. 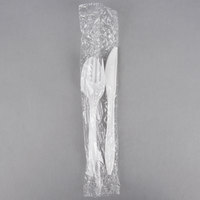 perfect for everyday use (school lunches, etc) and for parties because sometimes people don't like the idea of unwrapped flatware. Great price too! What more could you want? 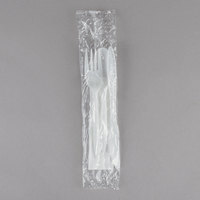 These individually wrapped plastic utensils are incredibly useful to our family. From school lunches, dance class to the break room at work. They're a nice convenience to have in today's busy world!